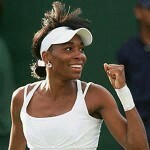 June 17, 1980 Venus Ebony Starr Williams, professional tennis player, was born in Lynwood, California. Williams began her professional tennis career in 1994 and won her first World Tennis Association singles title in 1998. Over her career, she has won 43 WTA singles titles, more than any other active player on the WTA tour. She has also won 21 Grand Slam titles, seven in singles, twelve in doubles, and two in mixed doubles. That is also more than any other active player, other than her sister, Serena. Williams received her associate degree in Fashion Design in 2007 and is Chief Executive Officer of her own interior design company. In 2009, she and her sister became part-owners of the Miami Dolphins, the first African American female owners of a National Football League franchise. In 2005, “Venus and Serena: A Biography” was published. January 30th in African American History – Edward Allen Carter, Jr.